Hello, everyone. So...here we are. My first post on this blog. Hello. My name is Rebecca, and I am a runner. Me looking awkward and embarrassed at my first race. No, I don't win races. No, I haven't run a marathon...yet. No, I'm not skinny, nor am I fast. But I am a runner. I am a runner because I run. I run slowly. Sometimes incredibly slowly. But I still run. I started running last year on April 15, 2013. How do I know the exact date? Because me going for a run was such a tremendous accomplishment that I actually wrote it down. At first, running was hard and terrible and painful. But the more I ran, the easier it became. Before too long, I was actually enjoying running, and I found myself looking forward to my morning runs. Running helped me lose over 20 lbs, lowered my blood pressure, and made me start to feel a little better about myself. 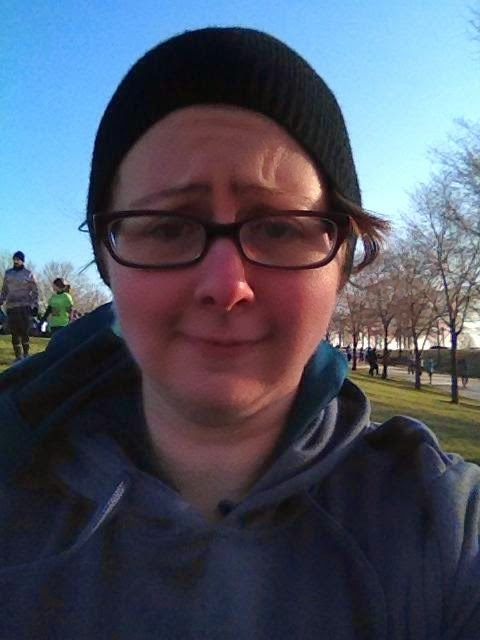 Then, in November of that year, I ran my first race - the Grant Park Turkey Trot 5k. No, I didn't win any awards. But I ran the whole race. I finished it. And I felt great! I was officially hooked. I though, "I just ran a 5k! I'm totally a runner now! Running is awesome!" Then...well...then things went downhill. I took a break from running. In fact, I took a break from pretty much everything I enjoyed. I was not in a happy place. Towards the end of February, I started running again in an effort to regain some control over my own life. Guess what? After only 3 months of no running, running had become hard and terrible and painful again. But I refused to give up. I knew that as long as I kept running on a regular basis, it would start to get easier. And I was right! It still isn't easy, but it is getting easier. It is a slow process, but one I hope to chronicle here in this blog. I've signed up for a number of races to help keep me motivated. Races aren't for everyone, and they fill me with anxiety because I don't do well with crowds. But they also motivate me to get out the door and go for a run because they give me a goal to works toward and a deadline for that goal. My first race after starting running again - Ravenswood Run 5k. Before I started running, I didn't think I could run. I was convinced that running was something that only skinny people did. I had reconciled myself to being one of the first people to die during a zombie apocalypse. You know what? I was wrong. I can run. I will run. Some days it is a struggle. Sometimes I fail miserably. But I refuse to give up. I am a runner.